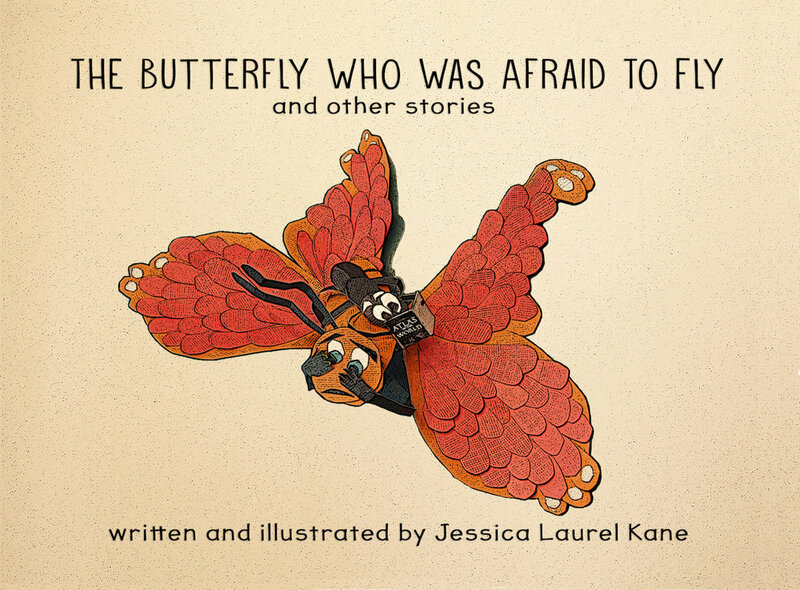 The Butterfly Who Was Afraid To Fly and Other Stories is a book of 8 original fables and poems written and illustrated by Jessica Laurel Kane. Click HERE to purchase the audiobook ($10, free shipping) or download via the audio links available below each story. To purchase the book ($15, free shipping, plus free audiobook) click here. A terrified butterfly is forced out of her cocoon and into the world where she meets an unexpected friend who encourages her to fly. When Little Bird swallows a cell phone, he inadvertently offends all the other birds in the neighborhood with his new chirp. A wicked witch falls from the sky due to a broom malfunction. After landing in a cornfield, she meets a farmer and they wind up helping each other in surprising ways. A boy who wants to be better than everyone else realizes he's made a mistake when he finds himself all alone. In the garden, there's one little seed who refuses to be happy, because she's too busy waiting to be a flower. A girl insists on eating all her food with sweets and learns a tough lesson. A little girl wants to know if the moon is cold. And even though everyone thinks her question is silly, the girl insists on finding out. A story about a man who finds the courage to be himself. When a man notices flowers of unfamiliar colors blossoming in his town, he worries they will ruin his garden and he tries to ban them. The story of a little girl determined to count to infinity. A little boy has an enormous pinky and his parents worry it will never fit into the world. A very cute dog wishes his owners would understand that there's so much more to who he really is. A little boy wants to get into his toy closet, but an elephant is blocking his way.